MKCREATIVE, LLC is a graphic design company located in the Mount Vernon district of Baltimore, Maryland. We offer graphic design (print and web), PowerPoint presentation design, and marketing consultation to non-profit organizations, professional associations, and labor unions. In addition, MKCREATIVE taps into a regional “brain-trust” of consultants and small businesses each of whom bring additional expertise and competencies to our client offerings. These areas of specialization include public relations, event management, copy writing, translation services, video production, interactive CD-ROM, DVD-Video, environmental design, and project management services. Follow us on Twitter at http://www.twitter.com/mkcd and check out our blog http://www.mkcreative.net/blog to see how we're helping community-based organizations rebuild communities and create healthy neighborhoods. 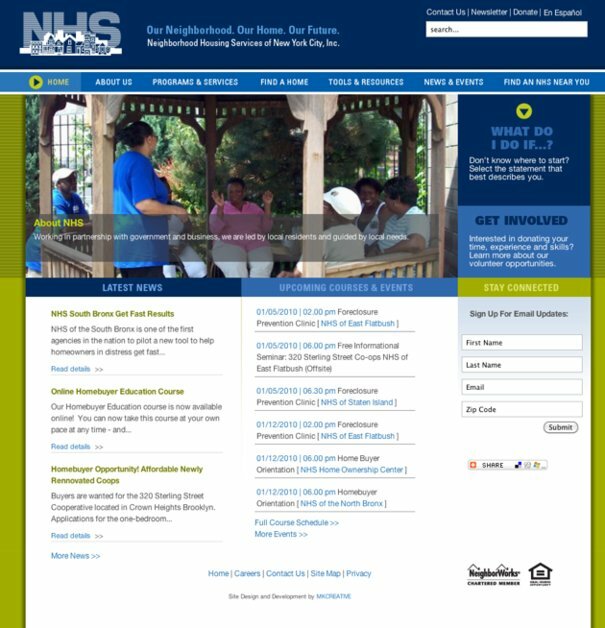 This is a screenshot from our latest homepage redesign of nhsnyc.org, a housing and community rebuilding organization in New York City.